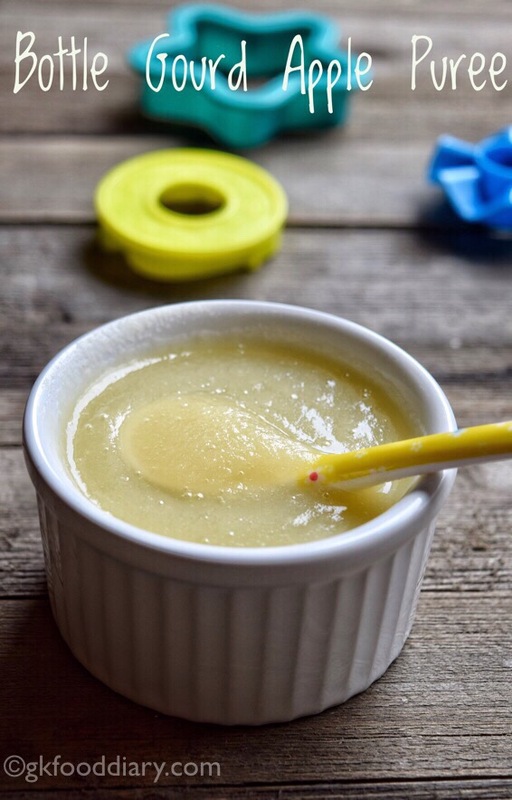 Bottle Gourd Apple Puree/Lauki Puree for Babies – nutritious puree recipe for babies with Bottle gourd and Apple. Bottle gourd/lauki/Surakkai is a nutritious vegetable with many health benefits. It especially benefits babies and kids a lot as it helps in better digestion and treats constipation, good for skin and hair also provides a cooling effect in the body. Bottle gourd can be given to babies from 6 months, and you can start with plain bottle gourd puree. 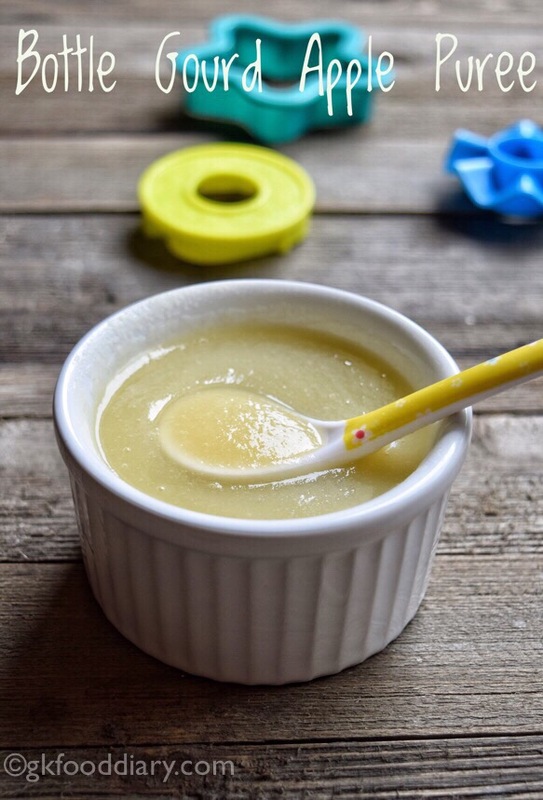 Some babies don’t prefer the plain taste of bottle gourd, so the mix of this bottle gourd & apple makes for a tasty sweet puree with added health benefits from apple. 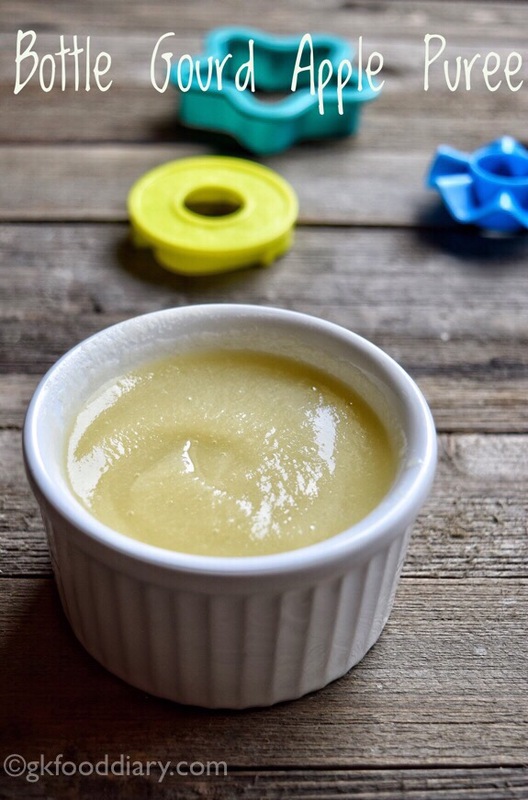 Here is how to make Bottle Gourd Apple puree recipe for babies. Wash the bottle gourd and apple in running water thoroughly. Peel the skin off with a peeler, cut them into cubes. Transfer them to pressure cooker and add ¼ cup of water. Pressure cook it for two whistles in medium flame. 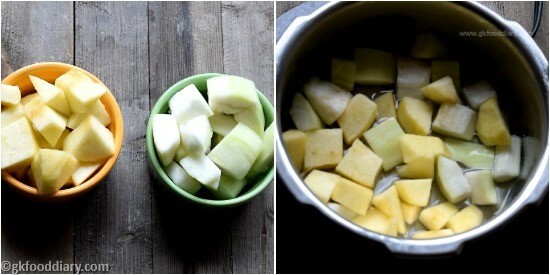 Alternatively, you can steam cook the bottle gourd and apple for 10 minutes or until soft. Open the cooker once pressure released. Transfer it to a blender. Grind it to a smooth paste. Add the water which is used for cooking to reach the desired consistency while grinding. 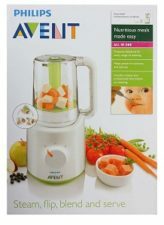 You could also mash it with a potato masher instead of blending. 1. Wash the bottle gourd and apple in running water thoroughly. Peel the skin off with a peeler, cut them into cubes. Transfer them to pressure cooker and add 1/4 cup of water. 2. Pressure cook it for two whistles in medium flame. Open the cooker once pressure released. 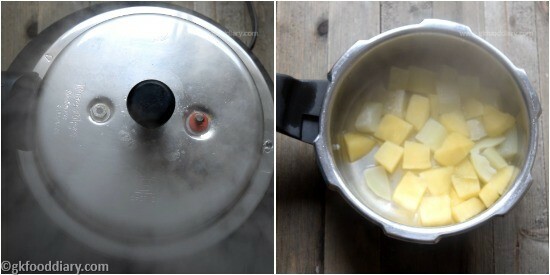 Alternatively, you can steam cook the bottle gourd and apple for 10 minutes or until soft. 3. Transfer it to a blender. Grind it to a smooth paste. Add the water which is used for cooking to reach the desired consistency while grinding. You could also mash it with a potato masher instead of blending. 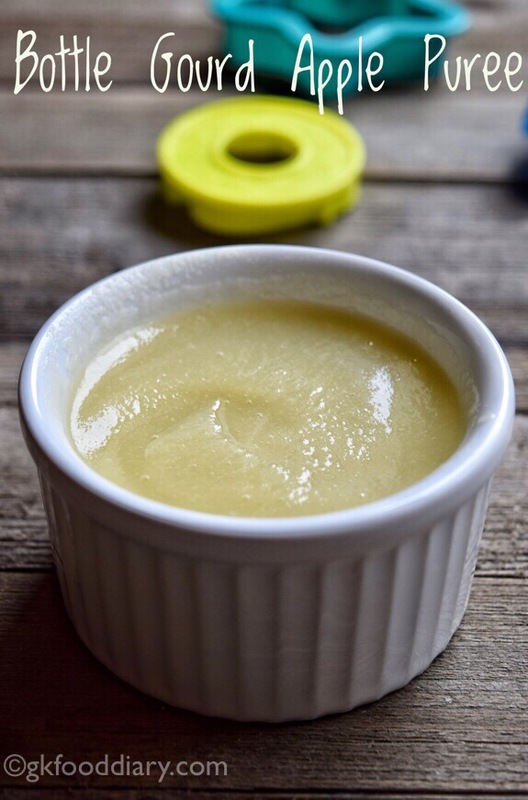 Bottle Gourd Apple puree is ready! 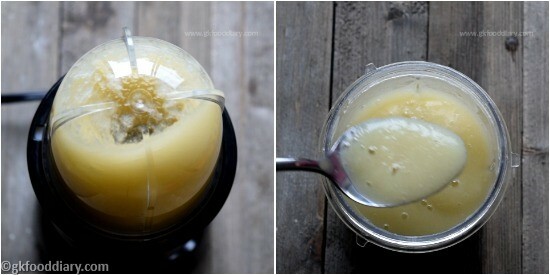 Adjust water quantity according to the thickness of the puree you prefer. Check with your baby’s doctor before introducing any new food to your baby. You could also mash it with a potato masher instead of grinding them.